2014 BMA Medical Book Awards Highly Commended in Radiology category! 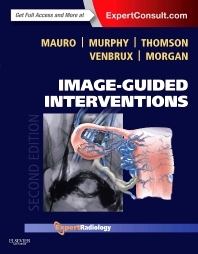 Image-Guided Interventions, a title in the Expert Radiology Series, brings you in-depth and advanced guidance on all of todays imaging and procedural techniques. Whether you are a seasoned interventionalist or trainee, this single-volume medical reference book offers the up-to-the-minute therapeutic methods necessary to help you formulate the best treatment strategies for your patients. The combined knowledge of radiology experts from around the globe provides a broad range of treatment options and perspectives, equipping you to avoid complications and put today's best approaches to work in your practice. Formulate the best treatment plans for your patients with step-by-step instructions on important therapeutic radiology techniques, as well as discussions on equipment, contrast agents, pharmacologic agents, antiplatelet agents, and protocols. Make effective clinical decisions with the help of detailed protocols, classic signs, algorithms, and SIR guidelines.